An Italian classic becomes a quick weeknight casserole with moist saucy chicken, colourful peppers and a zesty crispy topping. Add hot water to stuffing mix; stir just until moistened. Set aside. 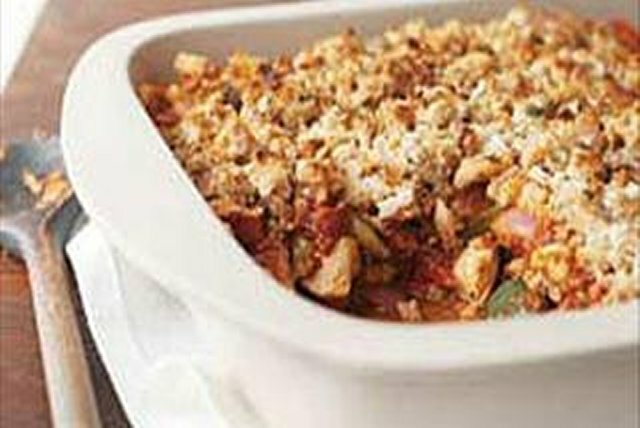 Combine chicken, peppers and onions in 8-inch square baking dish; cover with pasta sauce and stuffing. Bake 30 min. or until chicken is done an ingredients are heated through. Substitute 2 cups of your favourite frozen mixed vegetable medley for the peppers. Sprinkle lightly with Kraft 100% Parmesan Grated Cheese before serving.